With a few strokes of brush and ink and the simple instructions found in Super Simple Sumi-e, you can learn the art of this traditional Asian painting and capture the spirit of many charming animals from pandas to swallows and rabbits to dragons! 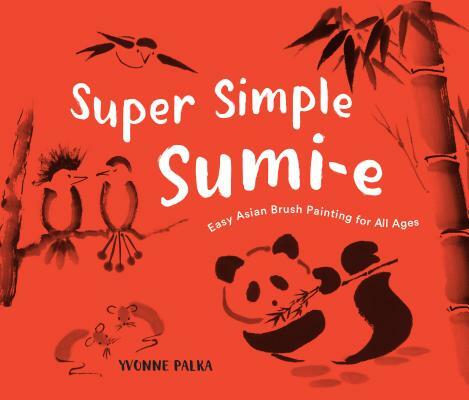 Creative children and curious adults will have fun learning the magic of sumi-e with the simple techniques illustrated in Super Simple Sumi-e. Learn how to make various sumi-e brush strokes and how to create animals, flowers, and bamboo with this friendly, easy-to-follow guide. Sumi-e means "ink picture" in Japanese. "Sumi" means ink and "e" means painting or picture. Since similar styles of painting with brush and ink are used throughout Asia this style of painting is often referred to as Asian brush painting. YVONNE PALKA is an award-winning sumi-e artist. A retired college professor, grandmother, artist, and naturalist, she loves introducing children and adults to the wonders of the natural world and the beauty of their own creativity. She loves sumi-e (Asian brush painting) for the simple elegance with which it captures the spirit of nature. Inspired by this simplicity, she teaches children and adults the essence of sumi-e painting in schools and other community settings. The same magic of the heart that gives rise to to her sumi-e paintings gives rise to her dragon stories. Yvonne lives in Minneapolis, Minnesota, where she paints, writes, gardens, and teaches.